After my hunting vacation last week, the first week of November and only seeing doe and a few small 1-2 year old bucks, I was feeling pretty discouraged. But, you cant get them from the couch... So with the wind blowing at 20 mph I figured I would haul a** out of work and try to hit the blind I set up on Saturday in the field I had been scouting. I know its not really much of a story, but I got out of work at 3:30pm and was in the blind by 4:00pm. By 4:20 I saw three does making there way into the field on the same trail I had been seeing them take. About 4:25pm I saw another doe bolt from the woods with this 10-point with his nose to the ground close in heel. Lucky for me she lead him with in 30 yards. 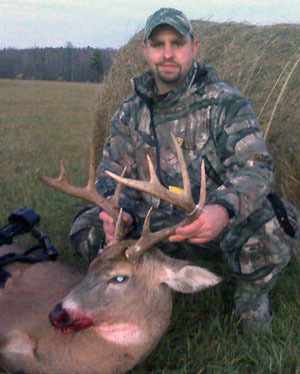 When I pulled up, my bow my stabilizer rubbed against the window flap and stopped him dead in his tracks. Bad move for him. I took the shot. It hit its mark perfect. He ran to the edge of the field about 50 yards and started his dance of death. By 4:30pm I was a proud NY hunter. Man I love this sport!